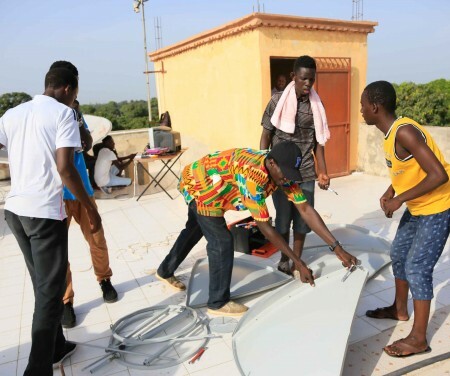 The Youth Empowerment Project (YEP) will be offering technical and vocational skills training opportunities to 965 young people in The Gambia through local TVET institutions. YEP is funded by the European Union Emergency Trust Fund for Africa and is implemented by the International Trade Centre in collaboration with the Ministry of Trade, Industry, Regional Integration and Employment (MOTIE) and the Ministry of Youth and Sports (MOYS) of the Republic of The Gambia. The technical and vocational training opportunities are provided under the pilot phase of the Skills for Youth Employment (SkYE) Fund launched by YEP. Through a competitive tender process, eight TVET institutions, namely, Sterling Consortium, Insight Training Centre, YMCA, Gambia Technical Training Institute, Five Star Security, Gambia Telecommunications and Multimedia Institute (Basse campus), Fajara Skills Development Centre, and Golden Hands Academy, were selected. All interested Gambian youth are invited to apply to one of the training programmes as described below. The training programmes are offered to qualified youth free of charge. Each applicant should only select one training program. If an applicant is discovered to be enrolled in more than one training program his/her scholarship will be rescinded. Commitment to complete the program. Willingness to undertake industrial internship. All interested youths are required to pick up application forms from Sterling Consorium office Busumbala, Bansang Youths Centre, Janjangbureh Youths Centre, Basse regional youth office, Mansakonko youths centre, Kerewan North Bank youths office. For any enquiries, please contact 3658926/ 2654772/ 3536629. All interested youths are required to pick up application forms from Insight centres in Serrekunda KMC and Sinchu Alagie WCR or download the form from www.insight.gm. For any enquiries, please contact 00220 4390226/ 9913402/ 6460289/ 7235884/3566954. Basic Security Guard Course for Private Security Personnel at the Gambia Police Force Training Academy in Yundum. Introduction to Illicit Drugs by the Gambia Drug Law Enforcement Agency. Introduction to International Humanitarian Law, First-Aid and Cardio-Pulmonary Resuscitation at the Gambia Red Cross Society Head-Office in Kanifing. Fire-Safety and Emergency Evacuation at the Gambia Fire and Rescue Services Training School at Bakau. Introduction to Anti-Terrorism and Military Security at the Gambia Armed Forces Officers’ Mess at Kotu. Customer Care and Public Relations at the Five Star Security Head-Office at Brusubi. All interested youths are required to visit the Five Star Security Ltd Head-Office located 1km from the BRUSUBI Turntable towards Yundum. For any enquiries, please contact 6605714 or 2333356. All interested youths are required to pick up application forms from any of the following GTTI campuses: Mansakonko, Kanifing, Banjul, and Julangel. For any enquiries, please contact 4377025. All interested youths are required to pick up application forms from GTMI BASSE, GAMTEL BASSE and BASSE YOUTH CENTRE. The form should be properly filled and returned to GTMI BASSE ANNEX with copies of applicant’s qualifications and identification (national identity or birth certificate) plus one (1) passport size photo. For any enquiries, please contact 9966461, 9991244, 9087282, and 9118846. All interested youths are required to pick up application forms from Golden Hands Massage, Hairdressing and Beauty Foundation in Kololi. Completed application forms should be returned to Golden Hands by 4pm on 14th September. Alternatively application forms can be completed, scanned and sent via email to: goldenhandsfoundation@yahoo.com. For any enquiries, please contact: 00220 7477066/ 002203156910. All interested youths are required to pick up application forms from Fajara Skills Development Centre at 5 Atlantic Boulevard or call 9932576. For any enquiries please contact 9932576.